MK Turbo - Make your miata go from Meow to RAWR! Pick three: Cheap, Powerful, Reliable. While it's true the MKTurbo kit was developed as a budget-oriented kit to fill a gap in the market, through over 10 years of hands-on experience with turbo Miatas, the MKTurbo kit was also carefully crafted as a powerful contender. By keeping costs low by cutting the correct corners, reliability and performance did not have to suffer. 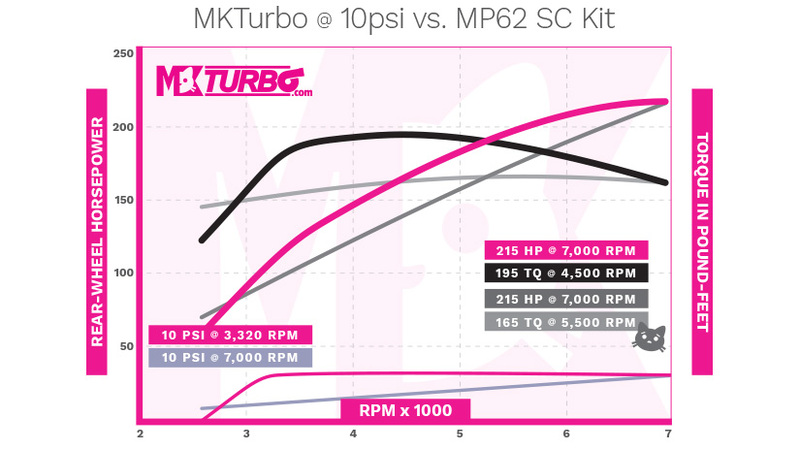 If you are boosting on a budget, the MKturbo kit is the perfect setup for your Miata. By carefully selecting and pairing parts, with custom made/sourced parts, there is no need to worry about longevity. And you can sleep well knowing, not only did you save a substantial amount of money, but you're also getting incredible performance for the cost. The MKTurbo 1.6L setup is made for 90-93 Miatas withg the factory 1.6L still installed. It utilizes a log manifold that is AC and power steering compatible. The downpipe, mid pipe, and axle back are the same as the 1.8 NA setups to make future upgrades to a 1.8L engine easy. The MKTurbo 1.8L NA8 setup is made for 90-97 Miatas that have the 1.8L engine. It utilizes a log manifold that is AC and power steering compatible. A 2.5” to 3” downpipe, that connects to 3” exhaust all the way to the exhaust tip. EGR block off plates are provided for both EGR ports on the intake manifold. The MKTurbo 1.8L NB1/NB2 utilizes a log manifold that is AC and power steering compatible. A 2.5” to 3” downpipe, that connects to 3” exhaust all the way to the exhaust tip. EGR block off plates are provided for both EGR ports on the intake manifold. The oil line kit will come with a -4an feed line and restrictors, -8an drain line, a tee block and fittings to bolt in at the oil pressure sender port on the block, drain fitting for the oil pan, and the input and outputs for the turbo. Basically everything you need to oil the turbo is included except for the drill bit and tap needed to tap your oil pan. The AN lines and fitting are all Aeroquip and covered in fire sleeve, they are locally made at a hydraulic shop.